Here are 7 ways motorcycle mirrors aid our journey. 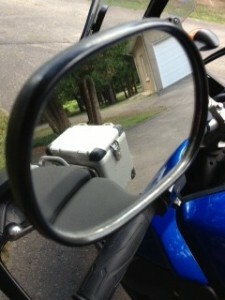 Motorcycle: Mirrors teach us about our past. But focus on them and we miss the present and risk the future. Click to tweet quote. Lesson: Life gives us all kinds of experiences; some pleasant, others we’d rather forget. They all serve a purpose on our journey. But if we get embroiled in the past, we miss the opportunities of present moment. We can still reflect while remaining focused on the future. 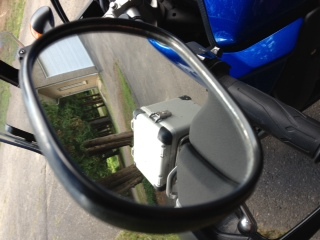 Motorcycle: Mirrors reflect what we can’t otherwise see, like what’s coming up behind us. They allow us to react appropriately in the present and prepare for the future. Lesson: Other people mirror back to us what we don’t see ourselves. They provide feedback on how our message is being perceived and whether their response is favorable, neutral, disappointing or hostile. They can also relay whether our message was received as intended. Motorcycle: Lens shape, cleanliness and rain drops act as filters and distort or impair the image we see. Taking the effect of these factors into account allows us to recalibrate and adjust accordingly. Lesson: Other people form opinions through their own filters and life experiences. While they act as mirrors for us and mean well, they project their own thoughts and fears on us. It does not change the amount of personal power we have. The first voice we listen to must be our own. Motorcycle: As a rule, street motorcycles have two mirrors. Focus only on one and we miss vital information captured by the other, which could affect our safety. Lesson: We need to consider feedback from multiple sources to get a complete picture. Ultimately, we take the opinions of others into advisement, and rely on our own intuition to guide us. Motorcycle: Mirrors will reflect whatever they’re focused on. To be of value when we’re riding, each mirror has an ideal vertical and horizontal setting that will give us maximum information on which to base our riding decisions. Lesson: Opinions and circumstance of other people can distract us from our purpose. It’s easy to get caught up in them without realizing When others are giving us feedback, make sure it’s relevant and aligned with our purpose. Motorcycle: Mirrors have to be a certain physical size before they can capture images of any value. They also can’t be so large as to interfere with the aerodynamics or physical displacement of the bike. Lesson: When we ask for opinions, make sure we’re getting thorough information. If our focus is too narrow, we may not have all we need to make an informed decision. Motorcycle: In the end, the message we get back from our mirrors is good, useful information, as long as we remember it’s dynamic and only a snapshot of a moment in time. It will be different the next time we look, which is why we scan our environment, including a mirror check -– ideally every 5 to 8 seconds. Lesson: Stay aware of what’s going on around us – in our body, mind and spirit. Each require constant attention and care to function at top efficiency and to give us the richest experience possible on our earth journey.